I'm not a big chili-maker. To be honest, I haven't been much of a chili eater either. Since it takes so much time to get a beefy chili cooked down to deliciousness, I just don't make it at home very much. Don't get me wrong, if it's something I love, I will put all the time necessary into a dish, but chili just isn't one of those dishes for me. I've seen a lot of white bean chili recipes lately and realizing that I could use chicken to make a lighter chili, I decided to make my own at home. The results were delicious. Next time, I'm making a pot of polenta so I can serve the chili on top. Heat the oil in a heavy bottomed skillet or dutch oven and add the onion and garlic. Saute for five minutes and add the chili powder, tabasco sauce, cumin and salt. Continue to saute, stirring regularly and adding a bit of the stock if necessary to keep the onion mixture from sticking to the bottom of the pan. Place the chicken breasts in the pan and allow to sear on both sides. Add the remaining stock and simmer for 10 - 15 minutes until the chicken is cooked. Remove the chicken from the pan and set aside to cool. Add the kidney beans and continue to simmer. When the chicken is cool to the touch, shred it and return to the pot. Remove from heat and adjust seasoning to taste. Divide between four serving bowls, top with scallions and enjoy! I love white bean chili! This version sounds great! Love the picture. I'm not much of a chili lover either and in fact, until my twenties I would have turned my nose up at any chili with beans in it. Slowly though I am learning to really appreciate it. looks good 'n hearty! Perfect for a chilly autumn eve. I had white bean chili over the weekend at a restaurant and it sounds nearly the same as your recipe. Yours looks fantastic! The polenta idea sounds even better. Sounds yummy. Sometimes I like white chili better than regular chili! I agree that beef chili is one of those things you can't skimp the time on, so white chili is a great alternative! Chili is on my list of things to make this fall! I seem to have a lot of things on my list, but anyway, this one looks great and especially because it is made with ingredients I almost always have on hand! I LOVE LOVE LOVE chili...however my beloved Durff partner isn't so inclined :) I'm hoping to win him over with this chicken & white bean version...thanks Jessica! 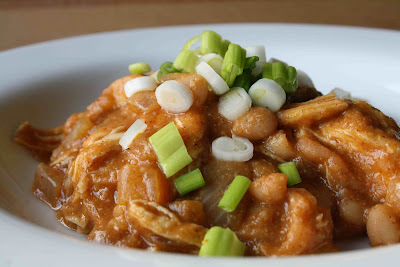 I love white bean chicken chili.... mmmm! One of my favorite things to make in the fall! This looks like a great recipe.